The reward for help locating the 13-year-old Monument boy who disappeared while at his father’s home near Durango has been increased. Friends have added $4,000 to the fund, raising the total to $20,000, according to The Durango Herald. The increase has also been posted on the Dylan Redwine search page on Facebook. 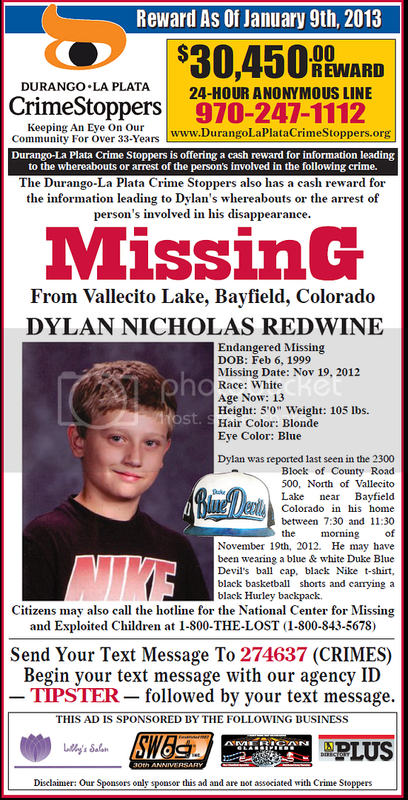 Dylan Redwine disappeared Nov. 19 while visiting his father’s house in Vallecito over Thanksgiving vacation. Numerous searches have failed to locate him and investigators are working around the clock on clues to his whereabouts. I hadn't seen this picture before...wonder where this is and what it has to do with Dylan's case? 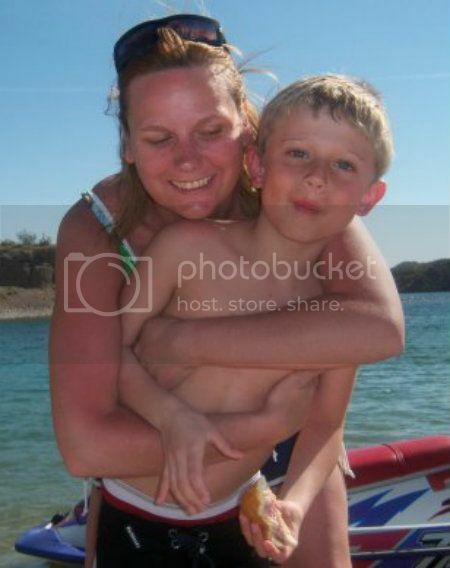 Per law enforcement - Dylan was last seen on November 19, 2012 at around 7:30 am. DURANGO, Colo. - The Dylan Redwine Task Force is continuing its investigation into the disappearance of 13-year-old Dylan Redwine. Dylan was reported missing by his father, Mark Redwine on Nov. 19, less than a day after arriving in La Plata County for a court ordered visitation over the Thanksgiving holiday. The number of tips from the public coming into La Plata County Sheriff’s Office, have dropped from several dozen per day to an average of 2 to 3 per day. However, all LPCSO Investigators are still assigned to the case as well as working other criminal cases. Investigators continue to make follow up contacts by phone and in person. As tips and other information become available, some are assigned to other Task Force members which include investigators from Durango Police Department, Bayfield Marshal’s Office, Colorado Bureau of Investigation, and the Federal Bureau of Investigation. Some evidence sent to the Colorado Bureau of Investigation has been processed and returned to La Plata County Sheriff’s Office. Information regarding that evidence will not be released since the investigation remains active. Family members continue to cooperate with investigators. Anyone who may have information on Dylan’s whereabouts is asked to contact La Plata County Sheriff’s Office Investigators Dan Patterson at 970-382-701 or Tom Cowing at 970-382-7045. There is a local tip line at 970-382-7511, where tips can be left on an answering machine that is regularly checked by Investigators. Tipsters can also call Durango-La Plata Crime Stoppers at 970-247-1112 or the hotline for the National Center for Missing and Exploited Children at 1-800-THE LOST (1-800-843-5678). Some of this is just heartbreaking! I took this video December 8th 2012 during the search at Lake Vallecito. I used bits and pieces to give you an idea of what the day was like. 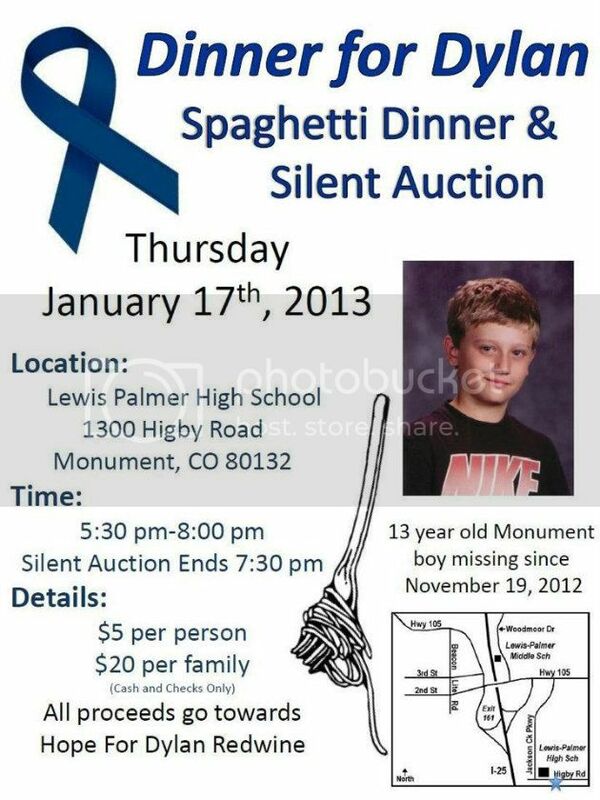 No new news on Dylan, but there will be another benefit dinner, this time in Monument, near Colorado Springs so everyone over there has a chance to help out. Please check the events for more information. Though it broke our hearts to have to do so we have been in the process of establishing a non-profit in Dylan's name since early December. We never, ever thought that it would have to come this far. Thus, another account has been set up at Wells Fargo under the name Hope for Dylan Redwine, which is also going to be the name of the organization. If you are making donations to Find Dylan Redwine, all funds that have not been used for the reward or search efforts have been transferred to the new account - please start asking for the Hope For Dylan Redwine Account when donating. The family is so very appreciative of the continued support that all of you are showing. We would not be this far without all of your efforts! Thank you, thank you from the bottom of our souls. It's absolutely heartbreaking Dylan is missing in the first place. And it's been so long now, without answers. ITA, it's just so sad. I don't remember seeing this interview, thought others might have missed it too. The disappearance of a Colorado teen remains a mystery. The search of Dylan Redwine began more than a week ago. "When we deal with kids it brings the emotions to a totally different level." "To leave Colorado not knowing or bringing them any closer to answers was very difficult for us." 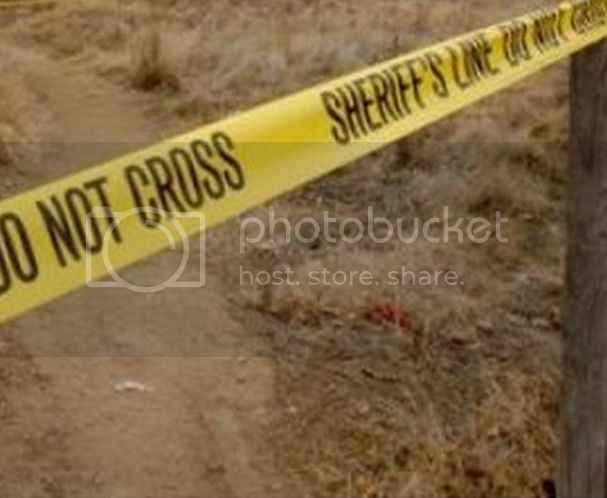 I inquired about the photo, it's a stock photo to indicate a crime story. Thank you for checking into the photo texasmom. It was one of those things that kept bugging me...I needed to know. Thanks TM for clearing up that photo. Why on earth do they feel a need to use stock photos? I hate it when they do that! You're welcome! I know what you mean about the stock photos, they should (at least) be marked as such if/when they are used. The response I received acknowledged that they could see how it could cause confusion and stated they were sorry about that. I just hope they keep Dylan in the news and do some digging to bring some facts to light in this case....and SOON! It's been too long, and LE is too quiet! Just one more thing that doesn't make sense!